Election 2008 « America, You Asked For It! WASHINGTON — Sure, Election Day 2009 will scare moderate Democrats and make passage of Obamacare more difficult. Sure, it makes it easier for resurgent Republicans to raise money and recruit candidates for 2010. But the most important effect of Tuesday’s elections is historical. It demolishes the great realignment myth of 2008. What happened? The vaunted Obama realignment vanished. Well, it’s now official. Minnesota Democrats have stolen the election to seat a genuine idiot in the US Senate. Here’s you’re new Senator Minnesotans. And just to remind everyone, Coleman was ahead before the dubious, repeated recounts that finally “found” enough votes to put the clown on top. Here are some of the questionable votes that show just how fraudulent the recount was. Sen. Coleman has 10 days to appeal this decision to the state Supreme Court, but MN Dems are another step closer to stealing this seat. Strange things keep happening in Minnesota, where the disputed recount in the Senate race between Norm Coleman and Al Franken may be nearing a dubious outcome. Thanks to the machinations of Democratic Secretary of State Mark Ritchie and a meek state Canvassing Board, Mr. Franken may emerge as an illegitimate victor. Mr. Franken started the recount 215 votes behind Senator Coleman, but he now claims a 225-vote lead and suddenly the man who was insisting on “counting every vote” wants to shut the process down. He’s getting help from Mr. Ritchie and his four fellow Canvassing Board members, who have delivered inconsistent rulings and are ignoring glaring problems with the tallies. 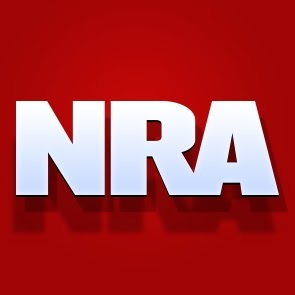 Roland Burris, appointed to serve out President-elect Barack Hussein Obama’s term in the US Senate by Democratic Governor Rod “The Senate Seat Salesman” Blagojevich, just won’t go away. Much to the chagrin of Senate Majority Leader Harry Reid (D-NV), the President-elect, and other leaders of their party. After clear signals from party leaders that no appointment from the governor who was caught on tape peddling his political influence would be seated, and in spite of the fact that Illinois Secretary of State Jesse White (also a Democrat) refuses to certify the appointment, Burris stationed himself at the Capitol and proclaimed himself the junior Senator from Illinois. Today, he plans to seat himself. Yesterday, the Secretary of the Senate refused to acknowledge Burris as the Illinois Senator and, as of now, Democratic leaders still say he won’t be allowed in. This should be interesting. That won’t be the only challenge facing the Democratic majority in the Senate as Al “Count ’til you win, then stop counting” Franken plans to take the seat after the MN State Canvassing Board certified the highly dubious recount that effectively stole the election in that state. Senator John Cornyn (R-TX) has promised to filibuster the seating of the comedian-turned-politician in light of Senator Norm Coleman’s decision to challenge the results of the election in the Minnesota courts, a move encouraged by the MN Supreme Court in its most recent ruling on the recount. It appears the opening of the 111th Congress is off to a rocky start for the Democrats who were sitting atop the world only 2 short months ago, basking in the glow of their election victories. Now, the chickens are coming home to roost as each new scandal comes to light. Well, it looks like the Democrats have successfully stolen another election. Franken now holds a 225 vote lead over Coleman in the Minnesota Senate race. After throwing out thousands of absentee ballots (disenfranchising thousands of voters), counting votes twice in Franken leaning areas, “finding” votes for Franken in the trunk of an election official’s car, inconsistently and irrationally throwing out obvious votes for Coleman and counting not-so-obvious for Franken, and now only counting previously rejected absentee ballots in areas that favored Franken, it appears comedian-turned-politician Al Franken will be seated as the next MN Senator. The obvious cheating seems to be the latest Democratic strategy to win close elections. If they’re losing on election day in left-leaning areas, they’re not worried. They now know they can simply keep counting until they win. They tried it in Florida in 2000, and until the SCOTUS finally put a stop to the madness they gained votes with each recount. They tried again in Ohio in 2004, but fortunately then-Republican Secretary of State Ken Blackwell was able to put an end to their strategy before they could steal enough votes. They successfully stole the Washington governor’s race that same year using this strategy and now it appears to have worked for them once again. Count on seeing Democrats employ this deplorable strategy every time they see an opportunity to overturn the results of an election. It’s absolutely disgusting. Coleman will likely file a lawsuit to challenge the results, but at this point it appears the Dems have succeeded in stealing another election. Senate Majority Leader Harry Reid (D-NV) today declared the MN Senate race all but over, and appears ready to overstep his constitutional authority and seat Democratic comedian-turned-politician Al Franken before a winner is declared in the MN Senate race. With around 2,000 absentee ballots apparently invalidated without cause (other than the obvious fact they’re likely to favor incumbent Sen. Norm Coleman, R-MN), Reid has decided that Franken’s dubious 47 vote lead is sufficient to declare him the winner and seat him as Minnesotan’s next representative in the US Senate. Even the current lead of 47 votes is suspect due to the numerous questionable tactics used by the State Canvassing Board in the several recounts since the November 4 election. Still, by his self-granted powers to subvert Minnesota’s legal process to determine the winner of the race, is making statements that imply Franken will be seated before the recount is officially over. If there’s a silver lining in this Democratic power grab to coronate a Senator instead of electing him, its that this may be the final straw for many GOP leaders who finally appear ready to do battle with the Machiavellian Democratic Party. Here are some quotes from influential Republican leaders on Reid’s latest dictum. Hopefully, this brazen, premature move by Reid in his quest to impose a near filibuster-proof majority in the US Senate will galvanize GOP resolve, resulting in a stronger, more cohesive conservative Republican Party. It looks like we can count on the Democrats to implement this “count ’til we win” strategy anytime we have a close election. In 2000, in Florida they counted, counted, counted, and counted again and were prepared to count some more before SCOTUS finally put a stop to it. Recall though, after the initial recount Democrats only wanted subsequent recounts in counties that would favor their party. With sympathetic election officials using magnifying glasses to identify flyspecks that “obviously indicated” the voter intended to vote for Gore, Bush’s lead dwindled with each recount. The Florida Supreme Court was perfectly willing to allow this obvious cheating until they “found” enough votes to put Gore on top. Fortunately, SCOTUS put a stop to it before the Democratic thieves stole the election. They tried to do the same thing in Ohio in 2004 in an effort to give the election to Kerry, but this time then-Ohio Secretary of State Ken Blackwell (currently a candidate for RNC Chairman) certified the vote to avoid this insanity yet again. Though stealing 119,000 votes would have been a far more difficult task, the Democrats were ready to try. Fortunately, Blackwell put an end to the “count ’til Dems win” process then. In Washington’s 2004 gubernatorial election, at least 1,392 felons illegally voted, 252 provisional ballots were wrongly counted, and 19 votes were cast from beyond the grave, according to Chelan County Superior Court Judge John Bridges’s opinion in a case brought by Dino Rossi, Ms. Gregoire’s Republican opponent. King County election officials admitted to doctoring ballots as well as discovering and counting unsecured ballots. Even after the first recount Rossi was leading by 42 votes. Then labor unions and left-wing groups such as Moveon.org pooled money to fund an expensive state-wide hand recount that gave Gregoire a 133 vote winning margin. Little wonder in left-leaning Washington state. And now, we’re seeing the same thing in MN with the US Senate race between Sen. Norm Coleman and comedian turned politician Al Franken. Numerous recounts have double counted votes that almost certainly favored Franken, thrown out ballots that would likely favor Coleman, and dubiously divined voter intent to favor Franken on quite a few questionable ballots. ST. PAUL, Minn. (AP) — Minnesota’s highest court on Wednesday ruled against Republican Sen. Norm Coleman’s attempt to keep dozens of possible double votes from Democratic-heavy precincts out of the long-running U.S. Senate recount, but left the door open for a lawsuit. The state Supreme Court unanimously denied Mr. Coleman’s request for a temporary restraining order to block the votes, which the Coleman campaign contended were duplicates that mostly favored Democratic rival Al Franken. The court upheld the state Canvassing Board’s ruling on the matter. The court’s decision leaves Mr. Coleman with fewer ways to make up ground in the recount, where he now trails Mr. Franken by 47 votes. Associate Justice Alan Page made it clear the issue of duplicate ballots was unresolved and said the court’s ruling was not binding in a future lawsuit. Democrats stealing election in MN? In an editorial on Foxnews.com, John R. Lott, Jr. and Ryan S. Lott shine light on the suspect results of the Minnesota State Canvassing Board’s power to divine voter intent on disputed ballots in the Coleman vs. Franken Senate race. Though they do reference the suspicious missing votes that miraculously appeared to narrow Coleman’s election day lead, they focus their attention on more concrete inconsistencies involving individual ballots. 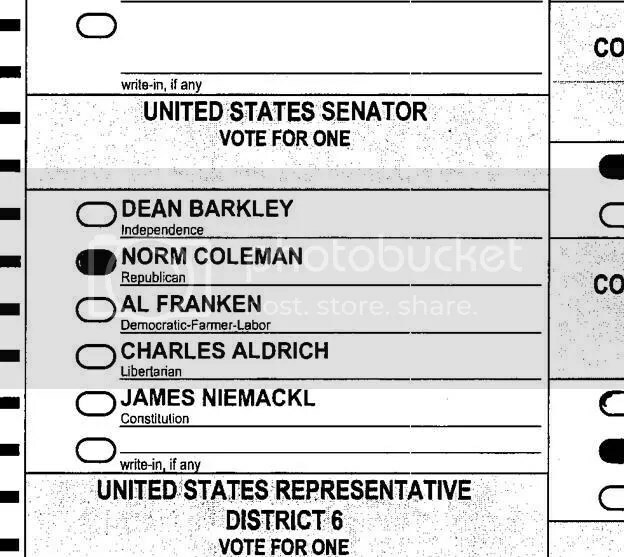 Using photographs of actual ballots, they demonstrate the certain bias of the Board in favor of Franken. They go even further, linking to the Minneapolis Star-Tribune website where readers can view photos of several hundred contested ballots, vote on how they would interpret the ballot, see the breakdown of how other readers interpreted it, and the actual decision of the canvassing board. Here’s an example of a ballot the Board decided was inconclusive, the vote wasn’t given to either candidate. There are several other examples of the clear bias on the Canvassing Board in the Fox article and on the Star-Tribune website linked above. It appears we’ll fight this battle in every close election from now until forever. If the Democrats are losing, they’ll just keep counting until they “find” enough votes to put them over the top. And there’s no limit to the methods they’ll use to “find” those votes.